Juliet Stevenson plays Emily Stilson, a former wing-walker who has had a stroke and is trapped in a mind which stops her making associations and causes her to speak a babble which makes perfect sense to her but not anyone else around her. Over a two-year period, this 80 minute play follows Mrs Stilson (we never see her husband, but see her son, briefly) as she starts to make more sense and to make more than transient contact with the world around her. One moving platform, some see-through curtains, a minimal use of projections, and stellar light work which projects Stevenson’s shadow as she flies, means that the one flashy conceit – our wing-walker spends the vast majority of the play airbourne in a harness doing a staggering range of acrobatic moves that must be as tiring as remembering the complex script – the play has to offer takes most of the attention. An uplifting play of hope, memory, and language, this is its first revival in the UK for thirty years. It is a moving and clever play which may not be everyone’s idea of a fun night out, but which I recommend you make time to see. 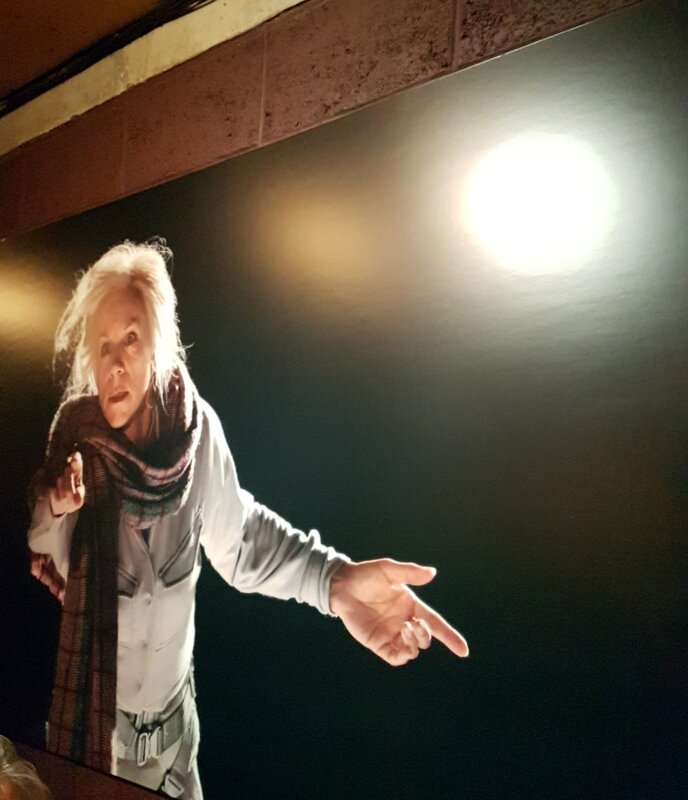 Samuel Beckett’s play is often said to contain one of the greatest roles for an actress in Winnie, who delivers practically a monologue while buried up to her waist in Act 1 and to her neck in Act 2. Indeed, the role has sometimes been described as the actress’s King Lear. And so we have a new production at the Young Vic, directed by Natalie Abrahami. 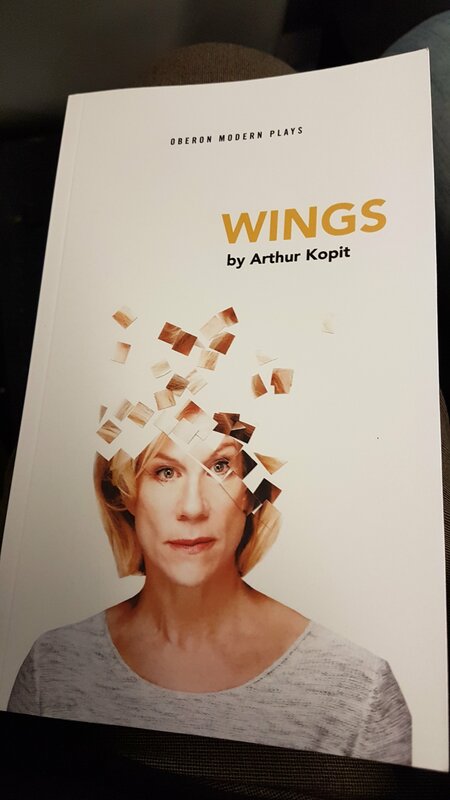 Winnie on this occasion is Juliet Stevenson, who has always been one of my favourite screen actresses but until today I had not had the pleasure to see her on stage other than one of the multiple readers in the Sylvia Plath’s Ariel reading at the Royal Festival Hall last year. She gives the eternally optimistic Winnie a heart and soul and makes her as funny as she is eventually heartbreaking, especially in her constant chatter and bawdy interactions with her husband Willie (rarely seen, and rarely audible – and we hardly ever see his face, just the back of his head – but nevertheless well played by David Beames who gives this thankless part life). ‘Happy Days’ can be read in many ways. Why Winnie has found herself buried in the earth (in this production, rocks and grit, rather than the usual sand) is never disclosed, although she does remember a time when she had the use of her legs. The time and place is unclear, and we do not know why Willie lives in his cave and why, as he appears to be able-bodied, he doesn’t leave or help free his wife from her predicament. Is the play a meditation on the uselessness of life, about the breakdown of companionate marriage, or simply a post-Apocalyptic fable? Winnie chatters on about the minutiae of life as she searches through her bag for small items which bring her pleasure or small nuggets of memory (a brush, a comb, toothbrush and toothpaste, lipstick, glasses, tonic, a music box, a gun). Her life is regimented by a harsh bell which rings for waking and sleeping, although the light (daylight or sunlight, one presumes, but here a harsh artificial light, in keeping with Beckett’s original stage directions for everything to be as unrealistic as possible) is constant. Stevenson makes this woman almost beautiful, although it is unclear how she is sustained without food or drink, and how she retains her energy. Her one piece of protection, her parasol, burns up in act 1. In the second half she looks haggard and pale and her chatter becomes more desperate and her refrain about everything being ‘wonderful’ sounds more and more hollow. When Willie finally appears (in the stage text he is ‘dressed to kill’) in top hat and tails, crawling across the rocks, we don’t know whether he is heading for his wife or for the gun which will bring release to both of them. It’s enough that he is on the move and within her sight again, and as she sings lines, brokenly, from ‘The Merry Widow’, this play of contradictions comes to a close. ‘Happy Days’ has sometimes been performed with regional accents or a bit of humour even in the second act, but here, Stevenson’s genteel lady in the printed dress puts across the desperation of her situation in a way which makes the play much more disturbing than, for example, the version which was filmed for the ‘Beckett on Film’ project. It may be something about the harsh sound of the bell (which doesn’t allow Winnie to close her eyes at all in act 2), or the wild eyes of the woman in pain, unable to move her head, or the weird empty silence as she cries out for her husband, or the disturbing story of the mouse and the doll, but this version of the play really packs a punch.